T-shirts, mugs, and keychains are just a few of the many generic products that are often given to employees as gifts. While adding a company logo or slogan serves as a nice touch, it does little to reflect a true thank for the hard work he or she has contributed during the year. Instead, do the research and find something that’s unique and memorable. A standout item shows that you’ve put thought into the gift, which in turn motivates your employees to continue to work hard. A workplace full of employees who feel valued can make for a more productive atmosphere so make sure your gifts are not just another small expenditure in the books. Tip: MOVA Creations are incredibly unique and mesmerizing self-rotating objects that will inspire your employees and show them that the business will keep growing and moving forward with their help. A printed acrylic base for the Blue w/ Relief Map Gloss Finish MOVA Globe. Besides all the logistical aspects such as storage, weight, and transportation (especially with larger quantities), the optimal gift size will ensure that it fits nicely into a space and that it doesn’t get lost in the shuffle. A gift that’s too large may not fit on an office desk or in an employee’s house and a gift that’s too small may be easy to lose. Tip: With a range of sizes from 4.5 inches to 8.5 inches and a selection of bases of various heights, MOVA Creations can be used as the perfect-sized accent on an office desk or as statement piece in a conference room, lobby display, or living room. 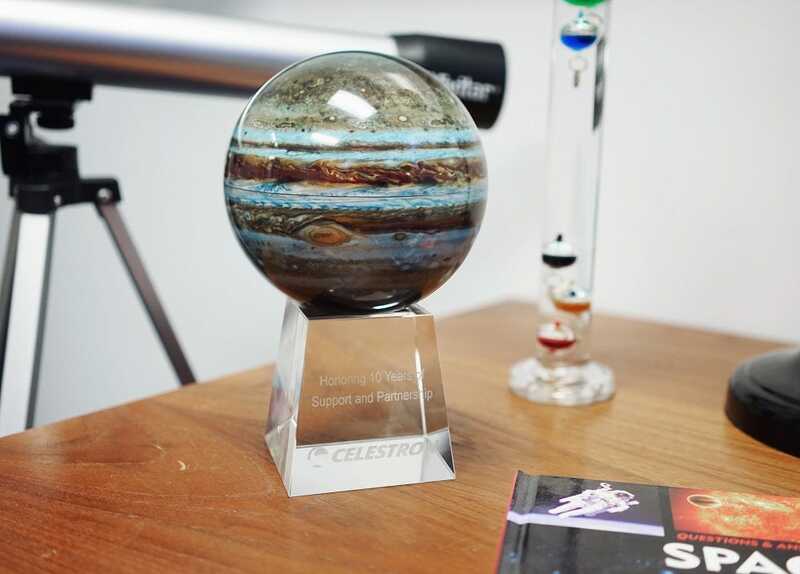 The stunning 4.5″ Jupiter MOVA Globe on a engraved medium crystal base. To cap it all off, personalization of your gifts will serve as icing on the cake. Customizing the product you’ve chosen with anything from a company logo to a short and simple thank you message can make all the difference. Whether the customization occurs through printing or engraving services, the end result will be more than worth the additional dollars. 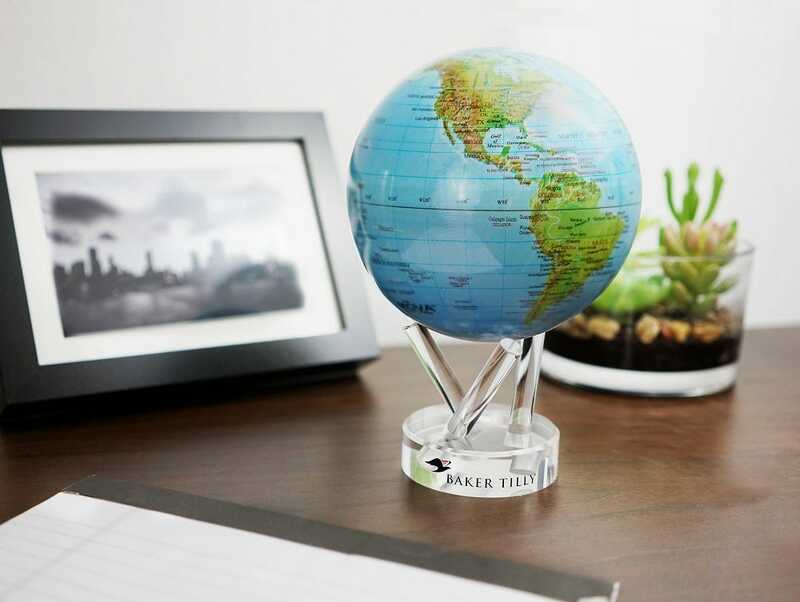 While including a thank you card along with the gift is a nice touch, customization of the item itself ensures that your employees will never forget where the item came from. 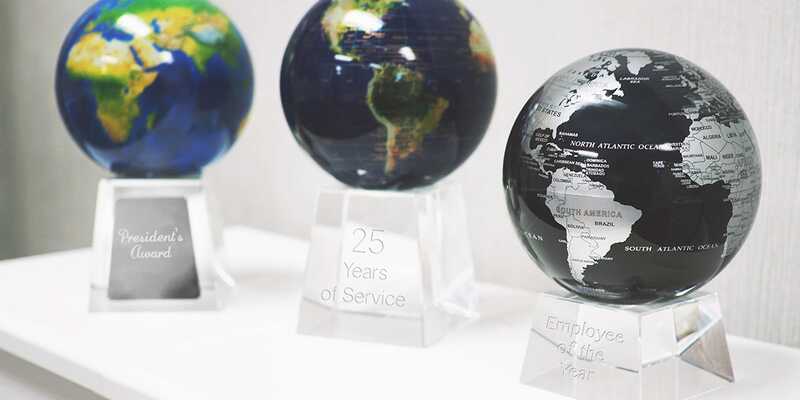 Tip: MOVA Bases, including our popular crystal bases, can be personalized through engraving or printing with a company logo, thank you message, or special milestones and achievements. Additionally, we can alter our current graphics to feature your company’s office locations or logo or even produce a completely new design provided by you. Just as you would invest the time and thought to find the perfect gifts for your loved ones, you should make that same commitment to your employees. Your employees work hard to make sure everything runs smoothly and are the backbone of any business. Our 3 step guideline did not mention pricing for a reason, namely because ultimately you know your employees and company the best, and whatever gift item and price point you choose, the returns from the extra motivation to your employees will be invaluable. Are you looking to give MOVA Creations as corporate gifts? Fill out this form and we’ll work with you to create a special gift for your employees.